Expand your horizons on board the, state-of-the-art Viking Sky, intimate and thoughtfully created by experienced. If you seek to expand your palate, knowledge, or just your circle of friends - Viking Sky is the ship for you. 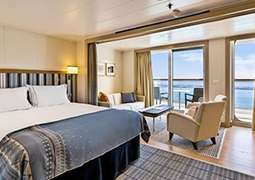 Onboard guests can expect to find a varied selection of staterooms, each of which offers a veranda. Categories range from Veranda staterooms to the ultra-luxury Explorer Suite. Guests can expect tasteful decor and amenities such as an interactive TV with movies-on-demand, luxury bedding, 24 hour room service and much more. With floor-to-ceiling windows guests can enjoy the best of ocean views while enjoying a delicious meal at the onboard restaurant. Menus change daily, allowing the use of local produce. This ensures passengers can enjoy a real taste of the region. The Chef's Table and Manfred's Italian restaurant also provide authentic dining experiences. There is a host of entertainment options awaiting on board. Passengers can enjoy a range of live shows, highlighting the culture of the region. There are a range of themes ensuring all guests will enjoy the show. There are two movie theatres on board with comfortable seating, showing new releases as well as itinerary related classics. Passengers can also enjoy port talks as well as onboard lectures. Viking Sky is a resort of it's own with plenty of activities available on board. The Sports deck complete with sports court provides the perfect opportunity to keep fit and perhaps even start a sports tournament. Those more interested in relaxation can visit the Nordic-inspired spa complete with snow grotto, sauna and more. The fully-equipped salon provides the perfect opportunity for further pampering. In the evening why not enjoy a drink and the stunning ocean views in the Observation Lounge? A world of activity awaits aboard Viking Sky. Casual attire is suitable for daytime while comfortable shoes are recommended for onshore excursions. "Elegant casual" is the dress code for evenings on board. For Female passengers blouses, dresses, skirts and slacks are recommended while male passengers are required to wear trousers and collared shirts while dining at evening venues.